It'd been a while since my last meal at GCM. What brought me back was the opening of Sari Sari Store, which bowed in mid-July. It's the brainchild of Margarita Manzke, Pastry Chef and co-owner at République. 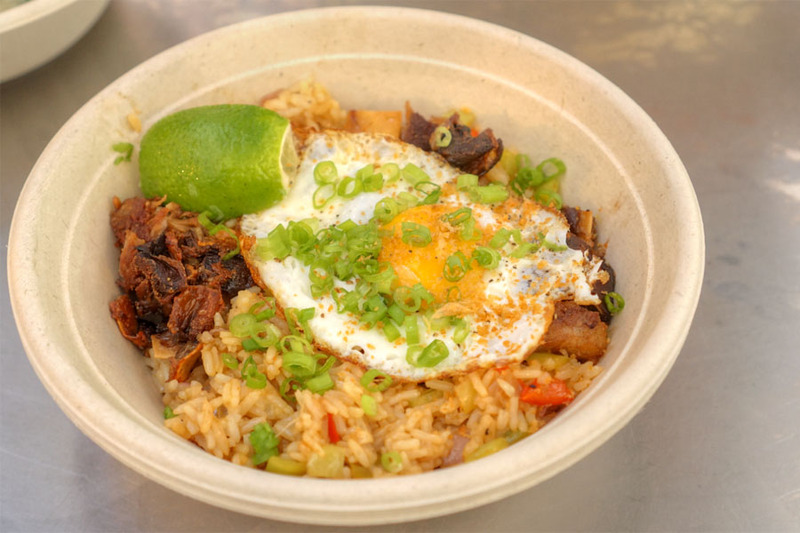 She's partnered up with husband Walter and the Sprout Group to bring us a Filipino food stall situated in the old home of Bar Moruno (which shuttered at the end of February). 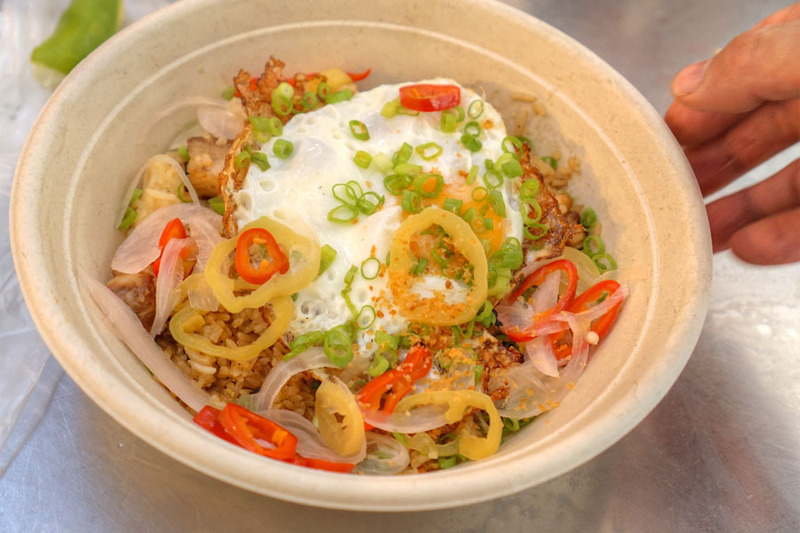 Named after the small neighborhood convenience stores oft encountered in the Philippines, the restaurant focuses its efforts on tapsilog-inspired dishes (fried rice and egg with various proteins). About the Chef: Marge Manzke grew up in the restaurant biz. Her parents first ran a small fast food joint in Quiapo, then opened up White Rock Resort, a hotel-restaurant outside of Manila, and she worked in the kitchens of both. She eventually moved to London to study at Le Cordon Bleu, and afterward, came to New York to enroll at the Culinary Institute of America. Following graduation, Manzke arrived in LA and found a job at one of the City's most iconic eateries, Spago. She then became a line cook at Patina, where she soon started dating Walter Manzke, who was the CdC at the time. To avoid any semblance of misconduct, she left Patina and started cooking at Josiah Citrin's Melisse, where she became sous chef. In 2002, the couple relocated to Carmel and opened three restaurants for David Fink's Mirabel Hotel & Restaurant Group: Bouchée (2002), L'Auberge Carmel (2004), and Cantinetta Luca (2006). She and Walter returned to the Southland in 2007 and took over the kitchen at Joe Pytka's Bastide, which had re-opened that September. Their tenure there was short though, and the duo was out by the following May (ex-Providence CdC Paul Shoemaker subsequently took over). The Manzkes then went to Church & State, with Marge as server/Pastry Chef and Walter as Chef, and stayed until March 2010. Following, they started thinking about Republique (which was supposed to be in the Arts District originally), but before that could happen, the two partnered with Marge's sister Ana De Ocampo for a project in the Philippines. In 2012, they opened Wildflour Café + Bakery in Bonifacio Global City in Taguig, and the concept has since expanded to five locations, with more on the way. 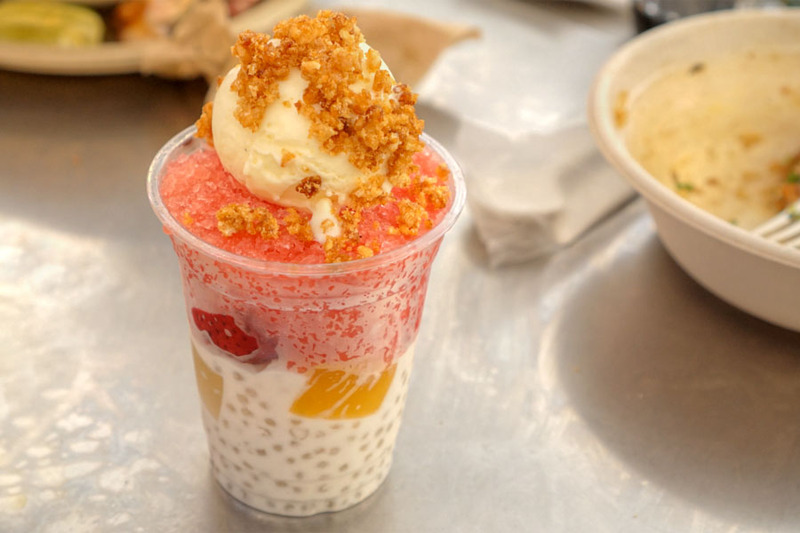 In the Manila area they also run Farmacy, an ice cream shop, as well as an outpost of Pink's Hot Dogs. Getting back to Republique, the restaurant finally opened at the end of November 2013, and quickly established itself as one of the mainstays of the LA dining scene. 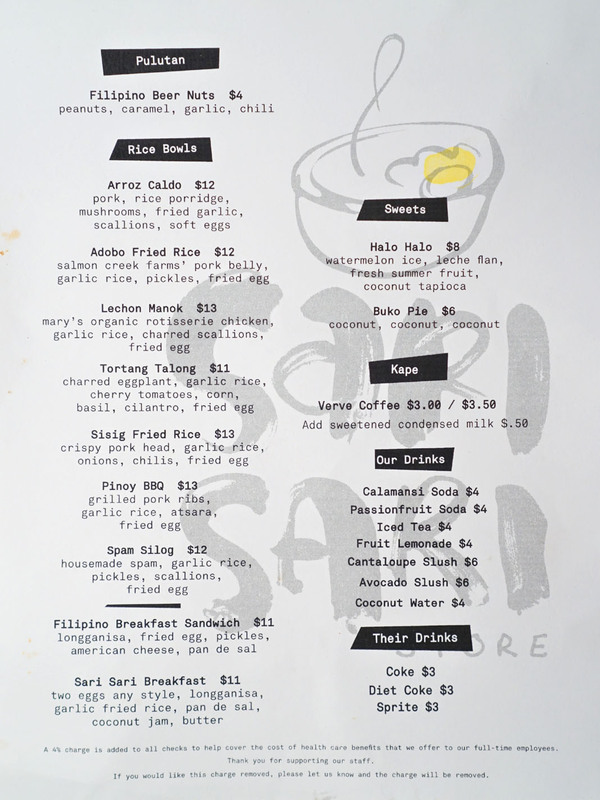 The menu's straightforward, listing various types of silog, a couple breakfast-y items, and two Filipino desserts. Click for a larger version. We began with the sisilog. 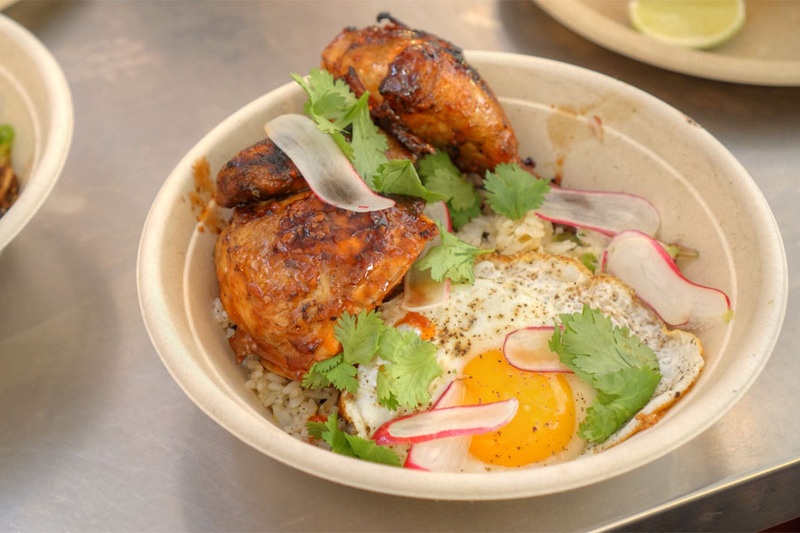 It was a cozy sort of dish, one featuring salty, crispy bits of pig head, accented by lime and the enveloping richness of a runny egg. It totally worked with the garlicky fried rice. 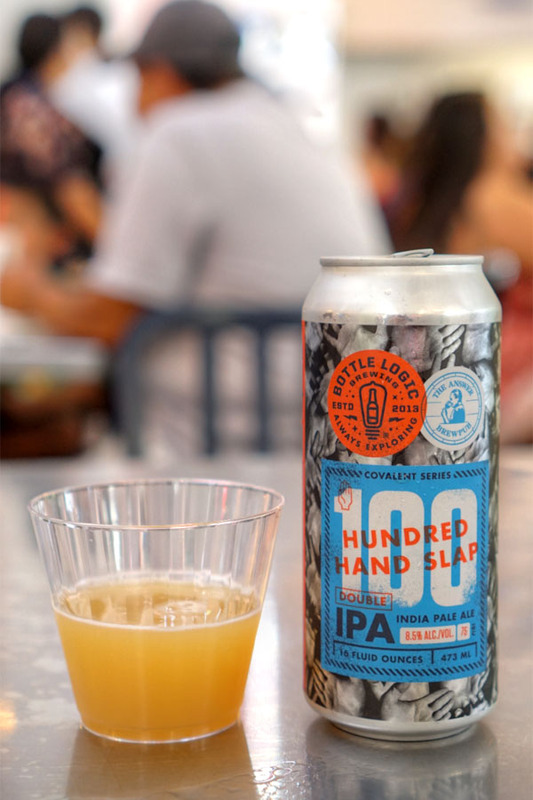 We had a few beers, and the first one we tried was the 2017 Bottle Logic 100 Hand Slap, a New England-style double IPA with Galaxy and Citra, created in collaboration with Virginia's The Answer brewpub. Nose was dank and juicy, displaying lots of bittersweet grapefruit pith. The palate was soft and slightly thick, with a good balance of hops and citrus fruit accented by a touch of grassiness. Pretty easy drinking. 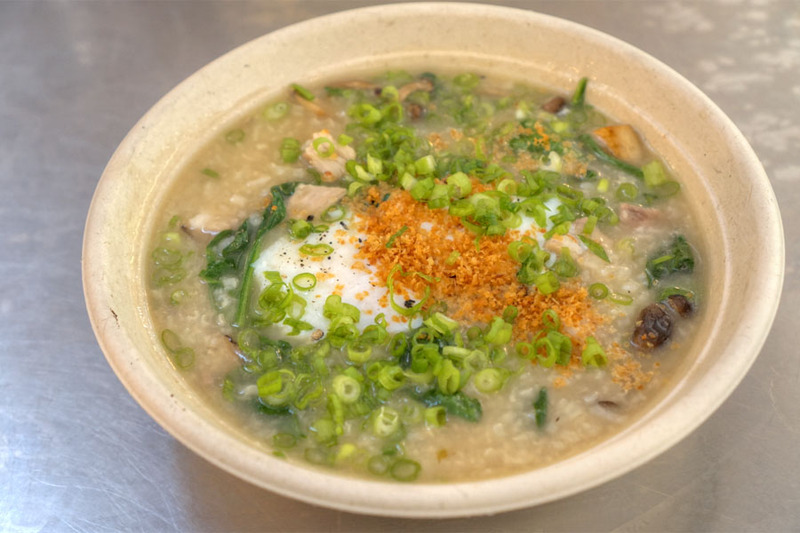 This congee-like dish was a standout for me. Coming out hot and homey, it showed off a great back-and-forth between bright, bitter veggies and earthy 'shrooms, all while chunks of pork added a welcomed heartiness to the dish. Some nice textures overall, and something I could just eat a big bowl of. 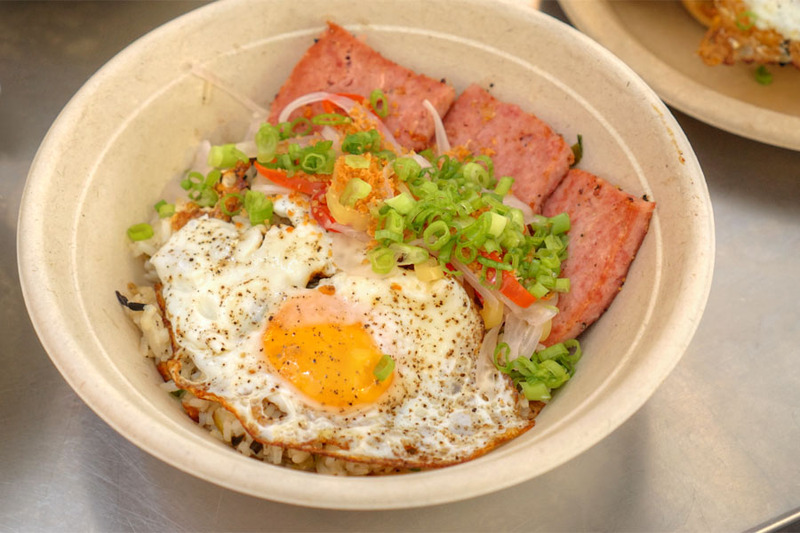 The spamsilog was another favorite, largely thanks to Sari Sari's rendition of everybody's favorite salty, savory, super satisfying pork meat product. The green onion and pickles provided an offsetting zestiness that really made sense, and again that garlic rice just worked swimmingly as a base. 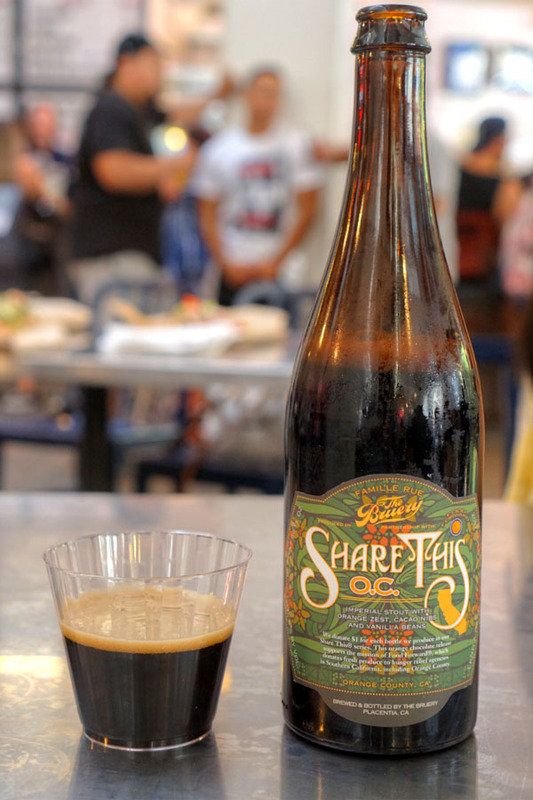 Our next beer was the 2017 The Bruery Share This: OC, an imperial stout with orange zest, TCHO cacao nibs, and vanilla beans. Lots of chocolate and roast in the bouquet, with light citrus. The taste brought more chocolate and fragrant vanilla, accented by subtle orange and a bitterness on the back end. 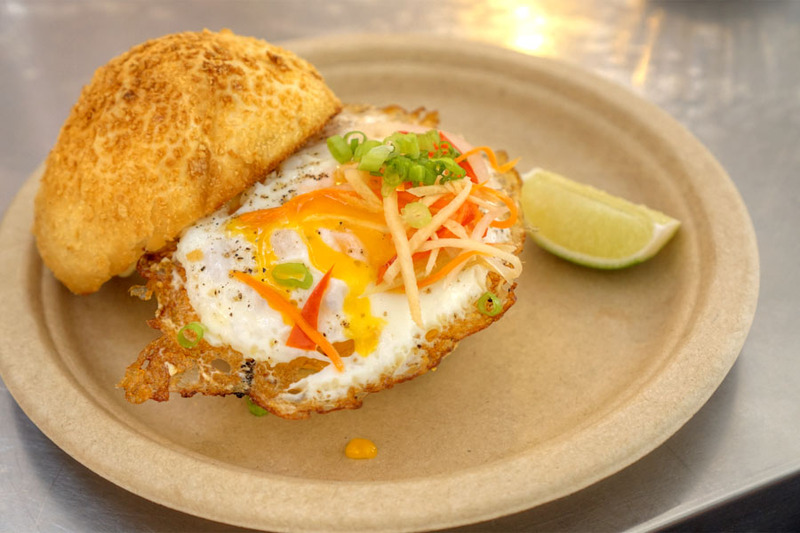 This Philippine take on the breakfast sandwich was a surprising favorite. The key for me was the interaction between the salty-sweet sausage and the in-your-face cheesiness of the dish. Along with the fried egg, pandesal, and pickles, everything just came together really well. Roasted chicken was delightful, coming out tender and juicy with a tasty mix of savory, sweet, and char flavors. I found it super enjoyable just by itself, but again the various accompaniments did a great job rounding out the dish. I especially appreciated the rice, which seemed a bit sweeter and less garlicky here. 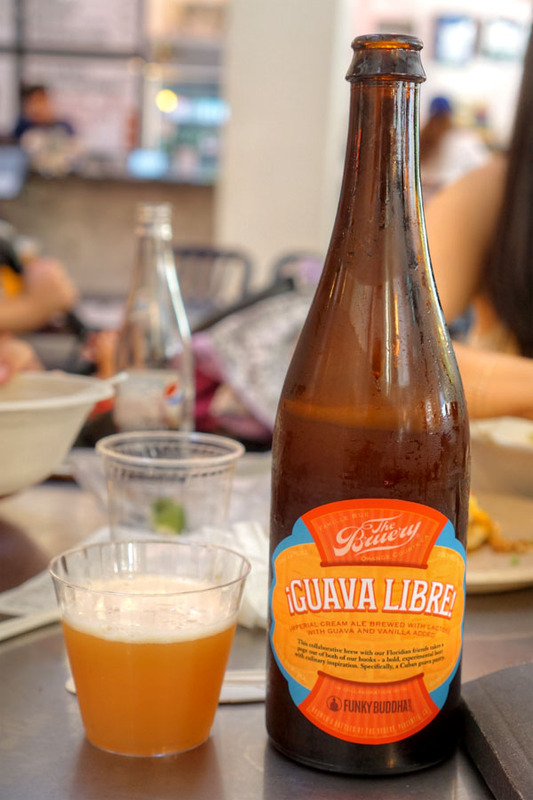 Created in collaboration with Florida's Funky Buddha, the 2017 The Bruery ¡Guava Libre! was an imperial cream ale brewed with lactose, guava, and vanilla, inspired by the Cuban pastry pastelito de guayaba. Aromas here were soft and smooth, with a decidedly lactic bent and apparent tropical fruit. On the tongue, think creamy, viscous, with sweet-tart guava at the forefront and lingering vanilla on the finish. 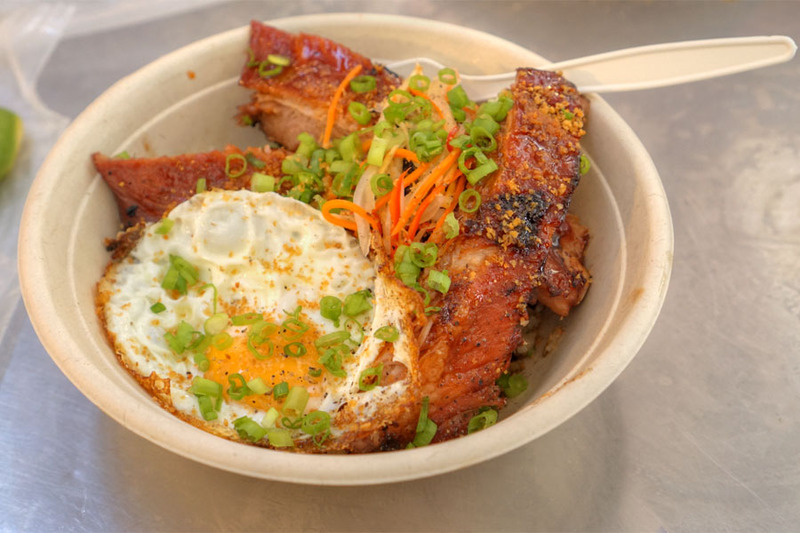 The adosilog highlighted crisp, fatty, super flavorful cuts of pork belly, which again meshed seamlessly with fried egg and the tartness of pickled veggies (I was particularly fond of the onions). Last up were the pork ribs, which came out pretty tender, with a nice commingling of sweet and smoky flavors. The meat definitely worked with its traditional accoutrement of atchara pickles, and once again, the rice really brought everything together. 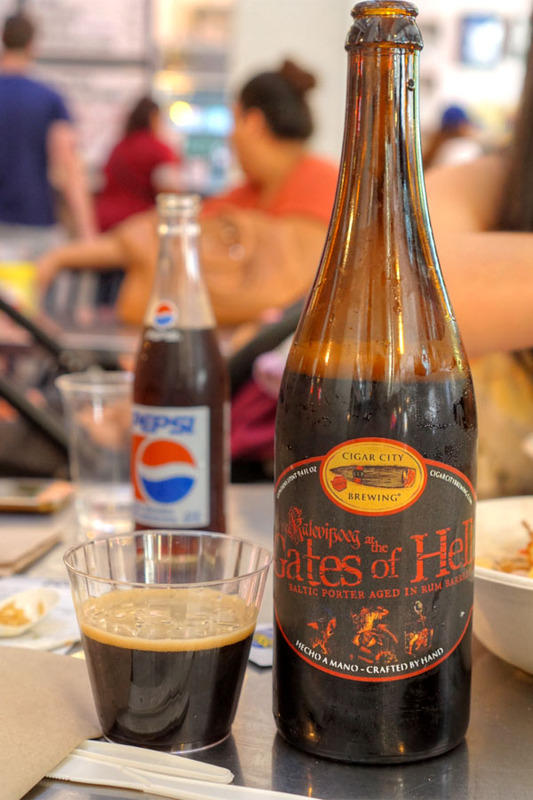 Our final beer was the 2016 Cigar City Rum Barrel-Aged Kalevipoeg at the Gates of Hell, a Baltic porter aged several months in rum barrels. The nose was filled with sharp, sweet, licorice-y spice, along with light chocolate, and had a distinct cola-like character. Taste-wise, I got licorice, rum spice, light roast, and a good amount of dark fruit to boot. Nice. Sari Sari had run out of their buko pie, so we had to manage with just this reimagined halo-halo. It was a smart take on the classic dessert, with the super refreshing watermelon granita marrying superbly with creamy coconut and the richness of the flan. Great crunchy-nutty bits on top, too. 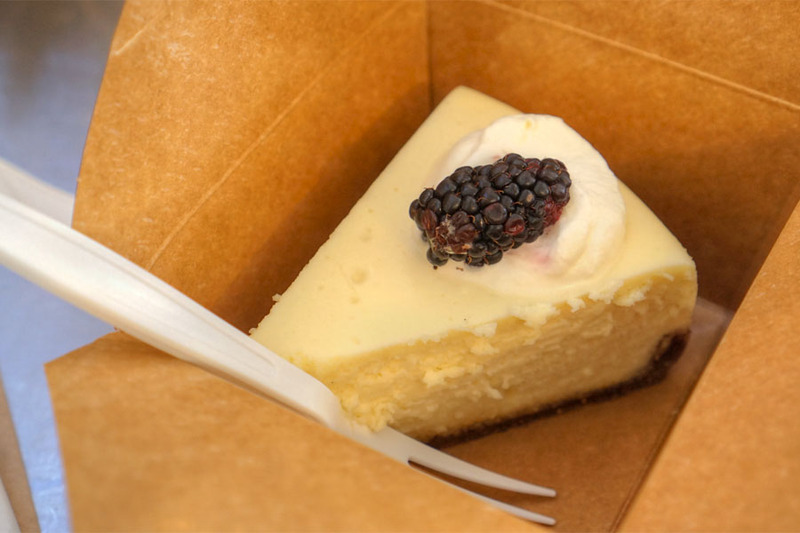 We concluded with some cheesecake from the Valerie stall. I was sad to see Bar Moruno go, but Sari Sari Store is a worthy replacement. 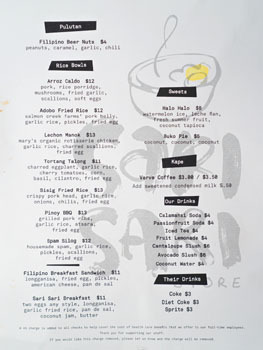 I enjoyed pretty much everything we had, and the food looks to do a fine job presenting Filipino fare in an approachable, quick 'n' easy manner. I'd actually like Manzke to do a more formal, sit-down type restaurant in the future (à la Lasa), though I'm not holding my breath. I like Rice Bar significantly more. Sari Sari's flavors seem kinda dumbed down a bit. Kevin, your overuse of "fancy" words is intolerable. "Bowed". "Shuttered". So much cleaner to say "Opened" and "Closed". And, stop saying "on point". I won't lie.... I missed reading your comment section. They tends to be give and take, but it can be fantastic on the right time!